SteemFest³ Updates - First names announced - Ticketshop open - Let's fire it up! First Names SteemFest Announced, tickets now available via the updated website. SteemFest's Hotel Deals Still Available: from € 55 / room / night (incl breakfast) - Book before mid September or prices go up and availability runs out as rooms become available for the general market again! Hey hey! I am heading to Kraków this weekend for venues inspections, meetings with all suppliers and to put some bears in cages. Prepping for the third iteration of SteemFest is well underway and with help of great sponsor's managed to get the plankton/minnow ticket price IMHO pretty affordable again. SteemFest is not an event for making profits, but an event for the community. Sponsorship funds go towards lowering the entrance fee for the plankton & minnow ticket, but I kindly ask you, if you have some Steem to spare, or did well last year's December (remember, remember those days in December?) to not abuse the plankton/minnow price and opt for a higher levelled ticket price closer to cost price. So this year, to force you into planning ahead, and hopefully preventing last-minute planning a dynamic schedule is implemented. 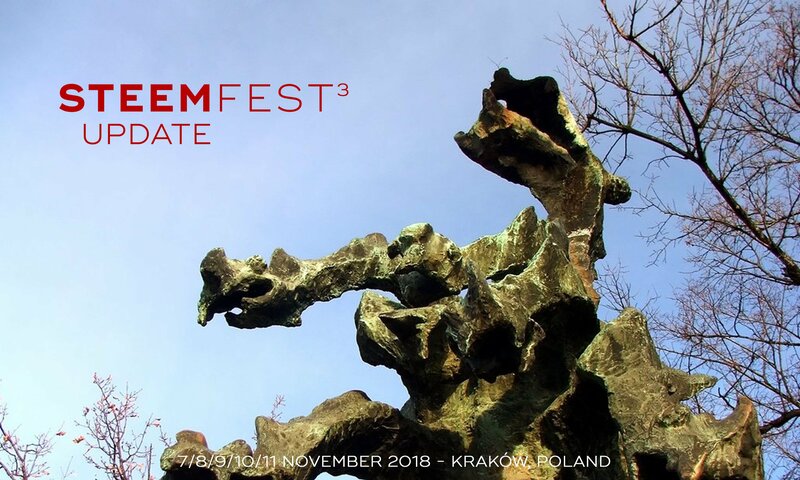 Please visit the completely updated SteemFest website which includes first program details, map of the venues, first speakers (many more to be announced) and links to the ticket shop / integral crypto ticket buy mechanism. Btw. as a tradition, just like past 2 years, @knozaki2015 immediately when the shop opened. Pretty bold! This year's minimum ticket price is a bit more expensive then last year, but still (IMHO) very attractively priced - The raise of € 66.66 - € 111.11 is due to forecasted & confirmed less sponsorship income, caused by bear markets. That said, the 'Plankton Ticket' € 277.77 is priced at about 1/2 of the costprice of your attendance, thanks to the support of Steemit.inc and the sponsorship of @scorum.community, @steemmonsters and @smooth, who like the idea to have an event to be as inclusive as possible. Please thank them! - @SteemFest is still open for sponsorships btw. Be sure to also read more on the @t-r-f page about the Travel Reimbursement Fund, I've just donated 1000 Steem to that account which gets distributed after Kraków to all applying attendees. Anyone is free to donate some to this community driven travel fund dedicated to SteemFest go-ers. I kindly ask, if you can reasonably afford it to look into options of buying another 'Ticket Type', for example the 'Regular Ticket' priced at 100% of the cost price of your attendance or even higher levels. Check out the SteemFest site's ticket section to learn more about all ticket types. Note that all tickets are equal by means of what you can do with them. Everybody is a VIP, it is just a matter of how much you contribute towards the event. Buy your ticket with crypto or fiat. Presentations, workshops and performances will generally last about 20 minutes max, unless more in-depth time is required. Yes, also this year's event will be streamed live. Win tickets & accomodations to SteemFest 3! Well, that's it for now. I'm about to pack my bag and hop on a plane to Kraków!